For many Americans, posting a status update or commenting on a photo has become a ubiquitous part of their daily routine. It is easy to forget just how quickly social media usage has grown. Five years ago, just 29% of online adults used social networking sites. Today, that figure has more than doubled to 72%. Historically, women have been especially avid users. Between December 2009 and December 2012, women were significantly more likely than men to use social networking sites in nine out of ten surveys we conducted. During this period, the proportion of women who used social media sites was 10 percentage points higher than men on average. When we include earlier surveys and our latest reading (spanning May 2008 through May 2013), the average difference falls slightly to 8%. 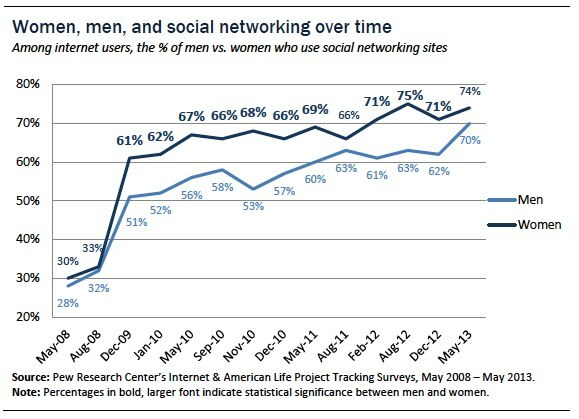 Currently, three-quarters (74%) of online women use social networking sites. Across different sites, men and women have varying degrees of engagement. 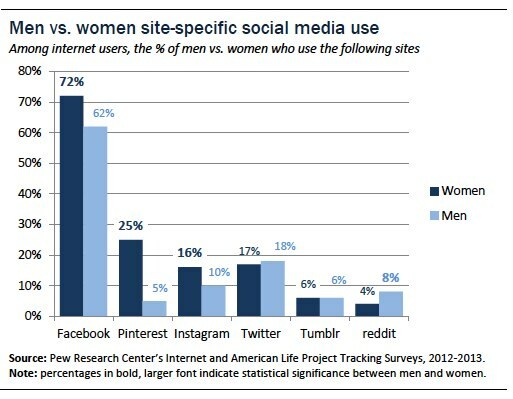 Among internet users, women are significantly more likely than men to use Facebook, Pinterest, and Instagram. A roughly equal proportion of men and women use Twitter and Tumblr, respectively. reddit is the only site we’ve measured in which men are significantly more likely than women to be users.